I recently attended a two day conference for work. Thankfully it was a drive home every night kind of thing so I got to be home to be with PB. This conference was almost exclusively lecture based. So I KNEW I needed knitting. But I didn’t have any autopilot knitting because Rainbow Pop gloves need my eyeballs on them. So I fished through my tonal sock yarn and pulled out a lovely skein of T & H Fiber Works Heather’s Favorite Sock in the Rosewood color that my mom got at a fiber festival a couple of years ago. Since I hadn’t put away my needles from my Rainbow Pop Sockhead slouch I simply cast on another Sockhead slouch! Here is my progress by lunch on Day 1…. And here is my progress by the end of day 2…. I got almost of the ribbing done over two days (conference and travel knitting). I got several compliments on my project and a few stares. But my knitting did strike up a conversation with other attendees about Cognitive Anchoring and the benefits of letting people use their hands to be better focused during meetings. All in all it was a great conference and some great knitting!! I’ve been procrastinating on casting on my next “easy bedtime” knitting project. 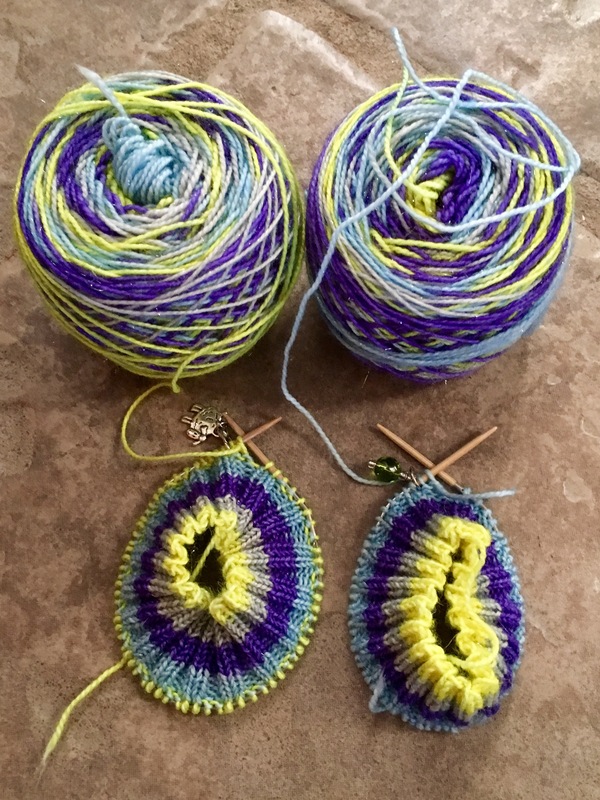 The Big Bang Vanilla Socks have been done for awhile and I knew exactly what I wanted it next…a Sockhead Slouch from my Lemonade Shop Stormy Day yarn. Why the procrastination? Well, I have this vision for the fabric that I know I want my hat to have. I want the rainbow blips of color to distribute without stacking, pooling or flashing. It was very clear even at this short amount of knitting that I was going to get total pooling. So I ripped it out and tried 144 stitches on US 2 needles…. This attempt was better and I made the pooling stop. But now the color blips were stacking and making sort of flashing stripes. While this is a totally cool effect…it’s not what I wanted deep in my knitterly heart. So once again I ripped the whole thing out. For the third attempt I used 164 stitches on US 2 needles. Much better!! The colors are still touching a bit but for the most part are randomizing and dispersing nicely around the hat. It’s not 100% what I was looking for but its really close. 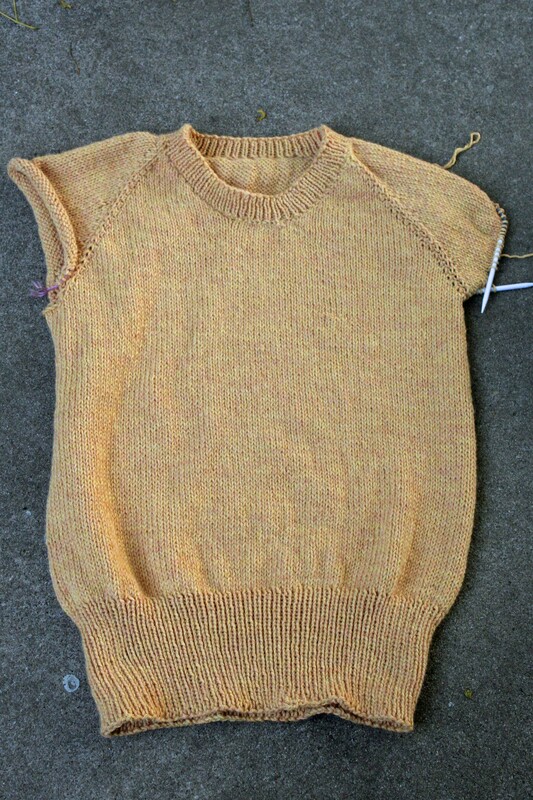 And given how much knitting time I get and how many brain cells I have left after two kids…..its close enough for now. The caveat….I have no clue how this will fit! I am just working to get a fabric I like. The Sockhead Slouch is an easy pattern and I plan to knit several inches of hat and then try on the ribbing portion to see how things go. Fingers crossed….worst case scenario is that I rip out again and start over. Darn, more time time knitting this beautiful yarn! P.S. This Lemonade Shop yarn really stood up to ripping and re-knitting!! For this WIP Wednesday I give you, Stashbustin’ #33 aka Brick is finally making serious progress!! After some major frogging and frustration, I think I have conquered the body of my sweater. And being of top down construction, I have tried it on and it fits exactly how I want. It’s loose without being baggy. I’m shooting for a cozy sweater to cuddle up with on weekends this fall/winter. I have picked up the stitches for one of the arms. 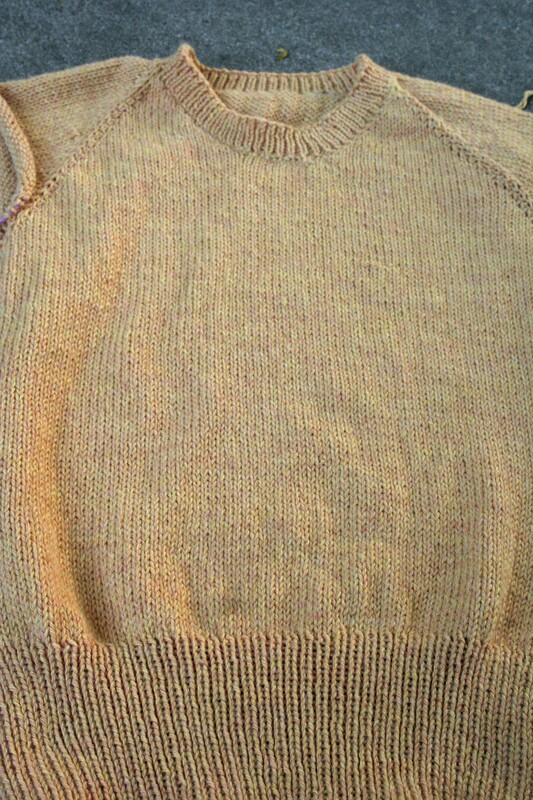 And based on the size of the opening and numbers of stitches, I’m definitely going to knit the sleeves with a taper. Otherwise I think they would just be WAY to big and loose. Good news is that I’m going to have enough yarn. Maybe even enough leftover for a small hat?